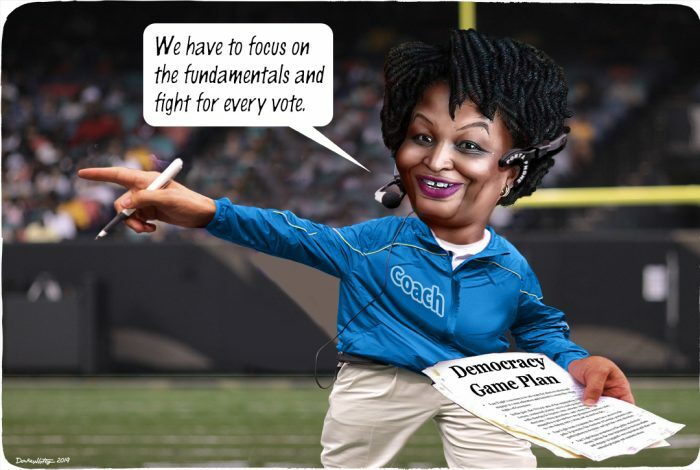 Stacey Abrams, head coach for team democracy? Photo credit: DonkeyHotey / WhoWhatWhy (CC BY-SA 2.0) See complete attribution below. We all know what to expect when President Donald Trump delivers his State of the Union address Tuesday night: It will be an hour of patting himself on the back, braggadocious bravado, making up threats and, of course, a lot of falsehoods and outright lies. Regardless, we hope that every American tunes in because we want as many people as possible to hear from Stacey Abrams, who will give the Democratic response. Abrams came within a few thousand votes of becoming the first female African American governor in US history. But that description doesn’t do justice to what really happened last November. A more accurate way of telling the story of that election would be to say that Abrams would now be the first female African American governor in US history if the midterms in Georgia had been fair. But they were not and she “lost.” That seems like a big claim to make but WhoWhatWhy is perfectly positioned to render that assessment. Last year, we decided to send a team of reporters to the Peach State to cover the race between Abrams and Brian Kemp (R) (who served as secretary of state at the time) — specifically focusing on election integrity. What we found was troubling, to say the least. We documented all of this in a series of exclusive stories and videos that you can find here. Kemp, as the state official overseeing elections since 2010, had — with Republican lawmakers — effectively rigged the process, making it as difficult as possible for likely Democratic voters, i.e., people of color, students, urban voters, etc., to cast ballots. At the same time, Kemp and his GOP colleagues spent considerable resources to prevent a transparent, verifiable election. Since today is Super Bowl Sunday and the game is being played in Georgia, here is what happened in football terms: Team Kemp started the game with a 10-point lead and got to appoint the refs — while Team Abrams was forced to play with one fewer player on the field at all times. That’s why Abrams has to take advantage of this tremendous opportunity and open the eyes of Americans to what is going on. For one night, Democrats should forget about climate change, the inadequate US healthcare system, gun violence, and the growing wealth gap. Because all of those things will be more difficult to address if (mainly) Republicans in key states continue to subvert democracy through voter suppression, gerrymandering, opaque voting procedures, and weak campaign finance laws. If Abrams focuses on those things, the mainstream media — which usually covers election integrity issues as more of an afterthought — will have to pay attention. There is no doubt that the American people want fairer elections, as we have noted before in this space. When given the chance to vote directly for measures that strengthen democracy, they usually do so, even in red states. Abrams’s address should be a call to arms to get more of these initiatives or constitutional amendments onto ballots across the country. More than a winning issue, it’s the right thing to do. She should also stress the importance of passing HR 1, the first bill introduced by Democrats after taking back the House. That legislation would strengthen democracy by addressing many of the problems that plague it today. Finally, Abrams should alert Americans to the demagoguery coming out of the White House. In his bid to preserve power in 2020, we have little doubt that Trump will try to launch an assault on voting rights and sow doubt about any election in which he will not be declared the winner. That is why now is the time to ring the alarm bells, in the most public forum, about the subversion of US democracy — and Abrams is the perfect messenger. We hope she does not waste this opportunity. The cartoon above was created by DonkeyHotey for WhoWhatWhy from these images: Stacey Abrams caricature (DonkeyHotey / Flickr – CC BY-SA 2.0) and coach (Tammy Anthony Baker / Flickr – CC BY 2.0).